I'm having another of these "Could not load file or assembly or one of its dependencies" problems. I have no idea what is causing this or how I could debug it to find the cause. Reference Include="Microsoft.Practices.Unity, Version=2.0.414.0, Culture=neutral, PublicKeyToken=31bf3856ad364e35, processorArchitecture=MSIL"
Can't find any reference anywhere which goes against 1.2.0.0 in any of my projects. Any ideas how I should go about solving this? I would also appreciate tips on how to debug problems like this in general. Check if you are referencing an assembly which in turn referencing an old version of unity. For example let's say you have an assembly called ServiceLocator.dll which needs an old version of Unity assembly, now when you reference the ServiceLocator you should provide it with the old version of Unity, and that makes the problem. May be the output folder where all projects build their assemblies, has an old version of unity. You can use FusLogVw to find out who is loading the old assemblies, just define a path for the log, and run your solution, then check (in FusLogvw) the first line where the Unity assembly is loaded, double click it and see the calling assembly, and here you go. Change the flag of Enable 32-bit application false to true. For me, none of the other solutions worked (including the clean/rebuild strategy). I found another workaround solution which is to close and re-open Visual Studio. I guess this forces Visual Studio to re-load the solution and all the projects, rechecking the dependencies in the process. Try to clean Debug and Release folders in your solution. Then remove and add unity again. Alternatively, you may want to just update the Enterprise Library to the latest version. Check the Web.config/App.config file in your project. See if the version numbers are correct. Despite the original question was posted 5 years ago the problem still persists and is rather annoying. The general solution is thorough analysis of all referenced assemblies to understand what's going wrong. 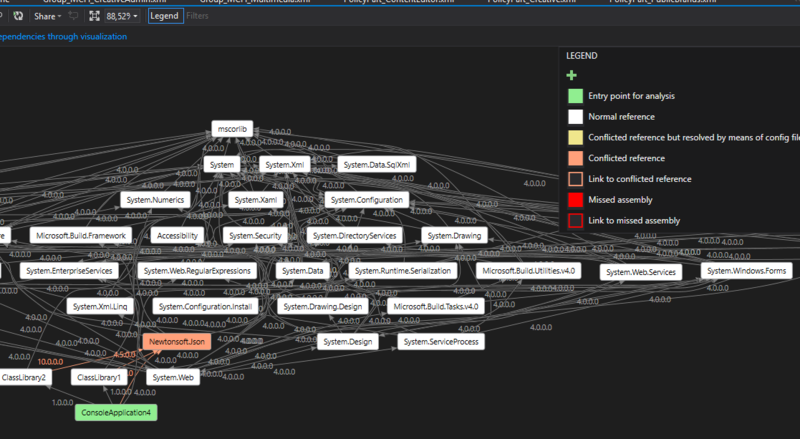 To make this task easier I made a tool (a Visual Studio extension) which allows selecting a .Net assembly (.ddl or .exe file) and get a graph of all referenced assemblies with hightlighted conflicting or missed references. I had similar problem. **Juntos answer is correct ** but you should note one important tip! AssemblyFileVersion is used by nuget but CLR does not care about it! 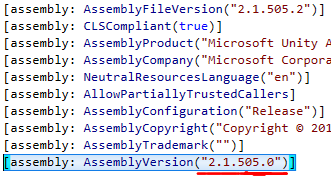 CLR is going to use only AssemblyVersion! See also: What are differences between AssemblyVersion, AssemblyFileVersion and AssemblyInformationalVersion? 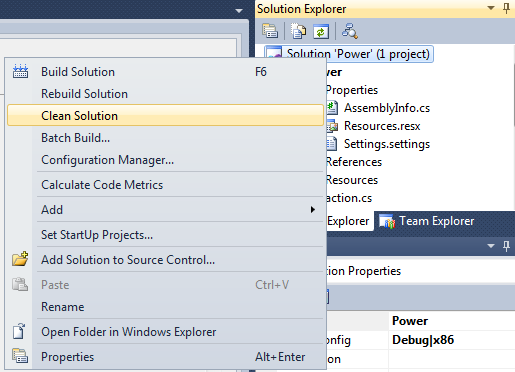 In solution explorer right click on project (not solution), in build tab choose Platform target : "Any CPU". Add your dll to additional assemblies(this way we can add external dlls in sharepoint). Not sure if this might help. Check that the Assembly name and the Default namespace in the Properies in your asemblies match. This resolved my issue which yielded the same error. Thanks Riddhi M. Following worked for me. In my case in the bin folder was a non reference dll called Unity.MVC3 , i tried to search any reference to this in visual studio without success, so my solution was so easy as delete that dll from the bin folder. You say you have a lot of projects in your solution ... well, start with one near the top of the build order. Get that one to build and once you figure it out you can apply the same fix to the rest of them. Honestly, you probably just need to refresh your reference. It sounds like you either updated your version and didn't update the references, or it's a relative path issue if you keep your solution in source control. Just verify your assumptions, and re-add the reference. This issue happened to me where one of my dependent libraries was compiling a DLL with "Any CPU" when the parent library was expecting a compilation of "x64". You have to delete Your appname.dll file from your output folder. Cleanup Debug and Release folders. Rebuild and copy to output folder regenerated dll file. I "Set as Startup Project" the unloaded/unfound library/project. I think it couldn't found the .dll because it was not in the assembly at first. Another possible cause: make sure you haven't accidentally given both of the projects the same assembly name in project properties. Look out for conflicting references. Even after a clean and rebuild, conflicting references will still cause a problem. My problem was between AForge and Accord. I removed both of the references, and re-added the references re-choosing the particular reference (particular to my case, just Accord). For me rebuilding the unity game without Unity C# Proects Checkmark worked. In my case, none of the proposed answer worked. The second step was important apparently as it did not work without it. Try checking if the "Copy to Local" property for the reference is set to true and the specific version is set to true. This is relevant for applications in Visual Studio. Note the stray characters at the end of the XML - somehow those had been moved from the version number to the end of this block of XML! Changed to the above and voila! Everything worked again. Okay this may sound very stupid, but heres how I solved the issue after trying out every other solution and spending a night on this stupid thing. I was getting the same error with some DLL missing from Bin Folder. I tried to delete , get back up everything from Team Foundation Server but didn't work. Got a copy of Bin folder from my office-matelocal machine, and replaced it. It didn't work either. At last, I manually FTPed server, got the copy of DLL which was showing up as missing, and then it started showing up that next file in the file list sequence is missing. Not the answer you're looking for? Browse other questions tagged c# .net reference compiler-errors or ask your own question.